The Omanu Surf Club with a patrolled swimming area. Also in this area are popular surf breaks including Tay Street. The location of this holiday home is convenient to everything you need to make your holiday so easy. You are within walking distance to shops, a great supermarket, a Service station, deli cafes, a Brewery and Bar, a delicious Thai restaurant, with take aways, the beach, the Tauranga Harbour, Blake Park sporting venue, indoor rock climbing, a trampoline park, tennis courts, to name just a few attractions. Numerous walks and bike lanes are scattered throughout the area. Bikes can be hired from a Cycle shop 100m down the road if you don't bring your own. 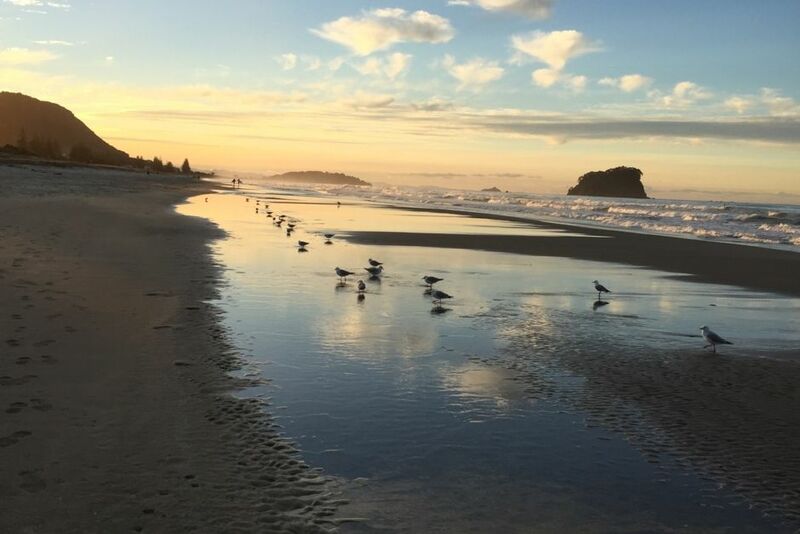 There are wonderful biking and walking circuits along the beach, and also around the Tauranga Harbour. There are numerous golf courses nearby. Great weekend Markets and Concert venues are within walking distance. the 'Den', a converted garage, lined and carpeted making it a handy seperate area for the family, teenagers and children to play and chill away from the main living area. There are many DVD,'s, Video's, games and a table tennis table. One wall is a blackboard where creative skills can be displayed. It opens outside to a safe and secure grassed backyard. There is an outside hot/cold water shower. Bikes, beach gear and surf boards can be safely left outside as this is a private and secure area away from the road. This private backyard has outdoor furniture and a bar b que for entertaining. There is off road parking for 1 or 2 cars. The house has a security gate making it safe for vehicles and belongings. There is also handy parking on the road outside the gate. There is a $300 bond payable which is paid to the property manager when at the same time your balance is due. This is refunded assuming no damages or additional cleaning requirements result after your stay. The Den- Bunk beds, and set up as a comfortable entertainment area for teenagers and children. .
Great place for family. Clean and tidy with everything you would need. House was clean and had everything we required for us and the children. Location is great close to shops and the beach. Would highly recommend. Great family holiday home close to the beach and shops. Great family holiday home close to the beach and shops. Awesome den with dvds and toys, great for the kids! Clean and spacious, comprehensive house manual and easy check in. Our team enjoyed staying here. Great location, close to the beach and the supermarket. This is the perfect property for a group of friends heading away for the weekend. This is the perfect property for a group of friends heading away for the weekend. There's enough space for everyone plus a great outdoor area with large table and chairs to enjoy the sun. We rolled the table tennis table out onto the lawn and spent an afternoon have a fun (but competitive) tournament. We hadn't checked out the location when booking so were pleasantly surprised to find the beach was only 250 metres away. No complaints, we'd definitely book again.